This is a crucial step for successful flooring. It’s the biggest single reason why garage floor coatings fail. All the hard work is at this step and it’s very important that it’s done properly. When the surface is not prepared properly, it will result in the product to fail. The epoxy product is blamed most of the time when actually the problem lies in the faultily prepared surface. Application error is the second cause of epoxy failure. That’s because the instructions of several epoxy floor coatings are not clear or not thoroughly explained. In this case, the person installing the floor is left guessing and filling in the missing detail. Having a proper understanding on the process of application, greatly reduces the chance of application error when applying floor coating or epoxy paint product. Before starting the project, it is important to read and understand the instructions properly. Go through them at least twice. If you have any queries, call the manufacturer of the product or ask the vendor where the product was bought. Most of them have toll free numbers to help with the queries about application. First of all, Inspect the garage floor before you buy your epoxy, to ensure that the concrete floor will accept a coating. 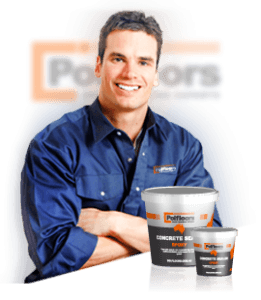 Epoxy does not adhere to sealed or painted concrete, including cure and seal product that was used on it after the concrete was poured. If the surface is covered with any sealer, then this has to be removed by mechanical equipment e.g grinding. A good way to test for the presence of a sealer on the concrete, is to spill water on it. If the water beads and doesn’t soak to turn the concrete darker, it will show that a sealer is present. If the water is absorbed in the concrete and is turning the concrete darker or the water does not bead, this will confirm that there is no sealer present. If you decide to prepare the surface by acid etching, but you are still unsure if the garage surface has a sealer or not, then test a small area by applying some of the acid etch. Look out for any fizz or the surface turning yellow. It will confirm that a sealer is not present on the surface. If the etching causes little or no reaction, then a sealer is present on the concrete surface. Note any pitting or cracking that needs to be repaired. Epoxy will not fill-in any cracks although it is self -leveling. You may want to consider optional garage floor covering like garage floor mats or interlocking tiles if you have extensive damage. A freshly poured typical 4” thick slab concrete floor, should be left to cure for about a month. If a coating is applied to early, it will delaminate because the curing concrete will still release moisture.